Music makes the world go around and without it, movies, short videos or even TV ads wouldn't have the same impact on our everyday lives they do today. Inexperienced film and video makers often think that you have to have huge production budgets in order to be able to use the music effectively in your videos, when in fact all they need is a little creativity and imagination. If you find yourself wondering how you can add music to video clips in Premiere Elements we are here to provide some help and assistance. Read on to find out how to add music to your video clips in this video editing software. Learning how to incorporate music into your videos is a fine art that may take a lot of practice, but Adobe Premiere Elements makes the technical part of adding music to video clips remarkably easy. Before choosing a song, make sure you have the right to use it in the video or simply use the copyright free music. Premiere Elements features a 'Music' track, a track that enables you to combine music files with atmospheric sounds, voiceovers or dialogues. If you would like to add music to the 'Music' track, click on the 'Music' icon on the editor's 'Action' tab and place the file on the desired location on the track. Right-click on the file you just added to the timeline and select the 'Fade In Audio' feature to gradually introduce the song, and you can also fade out by right-clicking on the audio file and selecting the 'Fade Out Audio' option. You can also highlight the music file and go to 'Applied Effects' to fine-tune 'Fade In' and 'Fade Out' effects or if you would like to apply more audio effects, click on the 'Effects' icon on the 'Action' tab and choose the audio effect that best fits the mood of your video. Adobe Premiere Elements offers a number of royalty free music scores that can be effectively used to create a perfect soundtrack for your video clip. Click on the 'Music' icon in the 'Action' panel and select the 'Music Score' feature. You will be offered to choose from a variety of different music genres such as Ambient, Pop-Rock or Country to name only a few. Drag the 'Music Score' you want to use in your video to 'Music' track and place it at a position at which you want the 'Score' to start. Once you placed the 'Music Score' onto the timeline the 'Score Property' window will appear on the screen. Adjust the 'Intensity' slider and check the 'Fit Entire Video' checkbox if you want the 'Music Score' to fit the duration of the video clip. This feature will enable you to easily create professional soundtracks for your videos with only a few simple actions and adjustments which is why using the 'Music Score' option is a great way to produce a unique and powerful soundtrack to your video. 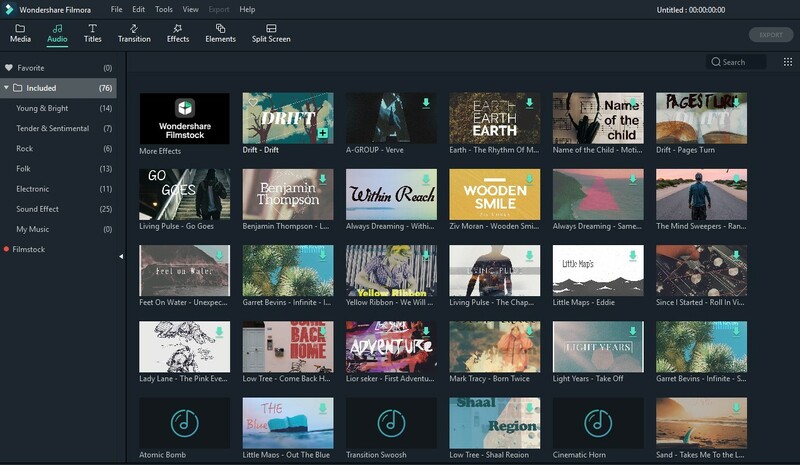 As great as Premiere Elements may be, it still fails to provide some more advanced audio editing options and users in need of a better video editing software should use Wondershare Filmora. The Wondershare's video editing software Filmora will enable you to choose from many different royalty-free tunes that cover several different music genres. In addition, the Filmora's users can choose from numerous audio effects, such as fading effect, changing speed and pitch, equalizer and removing background noise, which they can use to produce a memorable soundtrack that captivates the audience's attention. Watch the video below to check how to add music in Filmora easily.